I entered the business in 1998, just as the Web 1.0 Bubble started to take hold. So, I don’t have the decades of VC experience many other VCs do, but I have seen quite a few macro and VC cycles. Also, at Kepha, we are laser-focused on early-stage VC, which we call “venture building.” Early stage is all we do. So, it’s with those two perspectives in mind that I share this: the early-stage financing industry has indigestion. We went to the web sites of some well-known venture firms, tallied the number of companies they have, and counted the number of experienced investors on their teams. We excluded investments from which they’ve already exited. We also excluded retired partners and junior staff. We then did the same for some micro-VC and super-angel funds. We looked only at those funds with institutional funding. We thus got a sense of the “per investor portfolio company load.” They’re shockingly high numbers, as the charts below show. One world-famous VC firm has 17 companies per investor. A prominent super-angel fund averages 59 investments per investor. Moreover, we think these numbers are conservative, as most firms do not announce the seed investments they do. Counting those would make the numbers worse; e.g., at one recent conference panel, two VCs mentioned that their respective firms each invested in over 20 seeds in just a year. This is in addition to the 100+ companies they already have in the portfolios. Some VCs are clearly able to manage such high workloads. But, my guess is they’re in the minority. At Kepha, we are three folks with 30 years of venture capital experience who have started a new firm. So, we have the luxury of being on only a few boards thus far. But, if we don’t have exits, we too will have to decide whether going to 15 boards per investor makes sense for us. IMO, it doesn’t. We have a purposefully-focused model: we each only make one to two investments a year and we very much enjoy working with entrepreneurs. Having an overwhelming number of companies breaks our investment model. I don’t know if the above charts matter in the end, but my gut says that the entrepreneur isn’t being well-served in most situations. With more and more young entrepreneurs eager to start companies, I wonder if there are enough experienced investors around to help them? Frankly, I think the crowd-funding element of the JOBS Bill will only make matters worst. Entrepreneurship is about mentoring and learning as you go. It is not about getting checks. That’s just the beginning of the journey. I write about this because I’m increasingly running into entrepreneurs who raised seed money and are not getting further support from their current investors. I think this is by design. Let me explain. We recently spoke with two different and respected venture firms. They are doing more and more seeding through convertible notes. The VCs don’t get a board seat, the entrepreneur doesn’t have to set a price for his company, and the funding comes quickly in the form of a loan. Sounds perfect, right? Well, no. 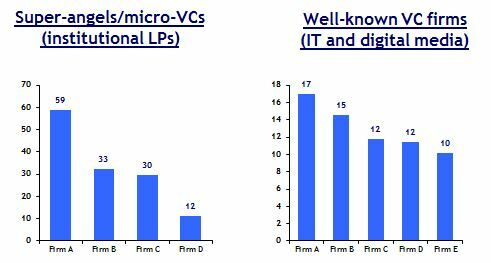 We asked VCs at those firms what percentage of these seed companies they expect to back in the next round. Their answers were identical: only 10%. All this reminds me of the old saying: “there is no free lunch.” Convertible notes have been around for decades. They’re not new. At this point in the financing cycle, they’re a great way for busy investors to seed-fund companies. Notes seem like a perfect financing form, but I think the entrepreneur should be fully aware of their down-side. I think there’s a reason why nearly all of the experienced entrepreneurs I know shun convertible notes. WRT the JOBS bill – just can’t believe that more liquidity and transparency in early stage is a bad thing – kindof believe in open markets – and think that early stage equity has been fiercely inefficient and lacked transparency for too long. Hi Andy, I agree about liquidity and transparency. I do worry, however, about the lack of real mentoring among the VC/seed/micro-VC/angel/super-angel crowd. There are a lot of people slinging little checks, but very few willing to join a Board and invest time and personal reputation to work with a start-up (like you do!). Instead, there’s the hope that someone else will join the Board. I understand the logic, if a super-angel as an *individual* is already covering 59 companies (mentioned in my post). So, sorry for being paranoid, I suppose. Best wishes to you and Amy for a great Easter….